Your Circle Time Area IS an Interest Learning Center! What? My Circle Time Area is an Interest Learning Center? You bet! Circle Time is a traditional daily event or activity in most preschool classrooms. The activities may include stories, calendar and weather discussion, attendance, songs, exploring materials and more. It should be an interactive area where children learn together as a part of a community. Your Circle Time Area needs to be set up in ways that reflect the needs and abilities of your children. 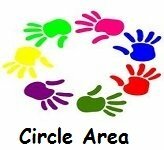 What Do Preschoolers Learn In The Circle Time Area? Circle time provides the opportunity for preschoolers to develop in all areas of growth and development! introducing materials that the opportunity for children to reason, guess and discuss how to use them. Download your FREE Circle Time Conversation Rules Poster! Preschoolers become part of a community or preschool family where their thoughts, ideas and feelings are encouraged and valued. Circle time allows children to share their thoughts about activities, topics, themes and general discussions such as what they did this weekend. It is a great environment for the children to get to know each other and and bond as a group! Circle time is all about language and discussion! 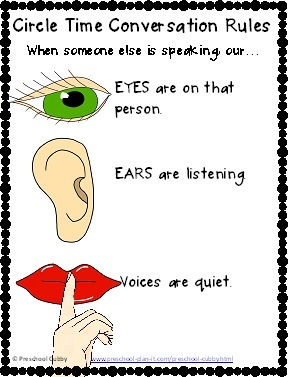 Appropriately, it includes discussions WITH children and not the teacher talking AT children throughout this time. Songs, stories and discussion encourage the use of letter sounds, recognizing letters and rhyming words thereby helping develop their language. Many movement activities, songs, games and activities during this time preschoolers them move and develop, as well as learn to control, the large muscles in their bodies. They also develop this by learning where their own physical space begins on a mat, carpet square, etc. and where it ends. They also begin to learn to respect each the space of others. The use of props such as manipulatives (dinosaur counters for graphing as an example), flannel pieces, passing a seashell around, etc. helps the children develop their small muscles. Discussions during Circle Time help children practice taking turns in conversation (let someone finish talking before you talk, etc.). They learn how to handle social issues through problem solving during role play, discussions, puppet shows or stories about solving problems with friends. Circle time also helps children to increase their attention span over time. How Should You Prepare the Circle Time Area? Circle Time is an area where intentional and thoughtful planning and preparation are required. A teacher should not just grab a book off the shelf that is theme or concept related, or sing the same 2 songs all year long. As discussed in the previous section, children have the opportunity to learn so much in all areas of development at Circle Time: Do not waste this time by not planning! What should you do to plan? When writing up your plans for the week, write down the theme or concept that you are focusing on, allowing you to consider specific circle time activities to support each. List the items that you do daily (Hello song, weather, Show and Tell, etc). You need to plan your circle time so that it is NOT too long. Adding activities that keep children engaged in learning may mean that you pass up your letter introduction one day. A Show and Tell Day is already a long circle time, do not add new activities that add time on that day. Choose activities that allow your children to be involved in the activities such as having props or flannel board pieces to use when singing a song or for some stories. The story is developmentally appropriate for your age group. The book is appropriate for a group story (i.e. Golden Books are great, but very long. They are best for one on one reading or home reading, not to a group). You know the story line well enough that you can change your voice (inflection or tone) for the different characters and/or parts of the story. Pre-reading stories will many times trigger ideas for you such as “Oh! I have a frog puppet that would be GREAT as a story reading helper!” Or, you may remember a box of manipulatives or toys you have in the closet that would be great to introduce the story with! Plan activities so that they are balanced with regard to active and passive. It is important to break up longer activities (those that last more than 5 minutes) to prevent your children from losing focus and interest and therefore becoming distracted and becoming disruptive. Example, after reading a story, stand up and do the Hokey Pokey or some other movement activity. Then sit back down and discuss the story or give out props to retell the story. Before any Circle Time, be certain that the children have had some active activity time or you will most certainly lose the focus and attention of at least half your group within 5 minutes. Here is why: Most circle times are at the very beginning of the day. The children sit in their cars or on the bus to school. They then sit at tables or on the floor for “arrival time activities” such as puzzles or other table activities. DO NOT expect them to then come to Circle Time Area and remain focused and sitting! They have already been sitting for 30 minutes or more!!! Most importantly, be prepared! Plan ahead. Have the items you will need ready the day before. If you have to go looking for an item, you’ve lost your children’s attention. Where Should You Set Up the Circle Time Area? This will all depend upon how much room you have in your classroom. Most preschools have a dedicated area or corner for Circle Time. That area is then multi-tasked and used for other activities during interest center time such as a place for floor puzzles; a place to have math or science bins available during center time. Is there enough wall space for charts/graphing, weather chart, etc.? Is there an outlet nearby for use with your CD player or other items you may need (we’ve used an apple juicer, popcorn popper, etc.)? Is there enough room for all of your children to sit in an actual circle together comfortably (on mats or carpet squares)? For more information on how to physically set up Interest Centers, go to my Classroom Design article. The materials and items to have on-hand will be determined from week to week based on your planned activities for Circle Time. Music is, or should be, a regular part of your Circle Time Area activities. You will need a portable CD player and access to an electrical outlet. A Wide Variety of CDs! Always add to your music collection! Ask for donations from parents! Check your local library or teacher store! Some of my favorite CDs for the Circle Time Area are Dr. Jean & Friends , Dr. Jean Sings Silly Songs , Kids In Action and Kids in Motion (both by Greg & Steve) and the Bean Bag Activities & Coordination Skills CD! Carpet Squares are available in larger and smaller sizes. Colorful mats are also a fun way to set up circle time! You will need space for a chart for graphs, taste tests, etc. Don't put too much on the wall. It is overstimulating and your children will NOT know where to focus (even if you are pointing at what you want them to look at). Less is more! A flannel or felt board is a must! Most stories or concepts you work on at Circle Time can be interactive for the children by adding flannel pieces! One resource I simply could not do with out is the book The Creative Curriculum for Preschool by Diane Trister Dodge. I believe every classroom should have one! If your program does not have a copy, check your local library or bookstore. It is a wealth of information on interest centers and could not be more developmentally appropriate! Circle Time should NOT JUST BE CALENDAR AND WEATHER TIME! As mentioned earlier on this page, there are so many activities you can plan based on concepts you are working on or the theme of the week or month! Check out my Preschool Theme Pages for ideas and activities for Circle Time! The purpose of this page is the discussion of the activities that could and should take place in your Circle Time Area as well as how to set up this area. There is so much that can happen to help encourage the growth and development of your children at your Circle Time Area! There is so much that can happen to discourage the growth and development of your children at your Circle Time Area. Be sure to read my 6 Do-s and Don'ts of Circle Time article to learn more! Your Circle Time Area, when planned well, is a prime opportunity for your children to grow and develop in all areas through the learning, sharing and discussions that are planned. Click here to read about other Preschool Interest Centers in your classroom!